An understanding of scientific principles could help duffers and other recreational golfers to improve their shot-making. (Inside Science) – You're eagerly waiting to try out your new set of golf clubs. But before you set out for the course, you can benefit from a lesson or two – in physics. "Knowing a few things about the fundamental processes involved in the golf swing is very helpful on the course," said Peter Dewhurst. A professor emeritus in theoretical and applied mechanics, and industrial engineering at the University of Rhode Island, in Kingston, Dewhurst has written "The Science of the Perfect Swing," recently published by Oxford University Press. "Golf is the game that has more interesting physics than any other," Dewhurst explained. According to Steven Nesbit, a professor of mechanical engineering at Layafette College in Easton, Pennsylvania, Dewhurst's book is the latest in a long line by authors who have focused on the science of golf. "The book is based on everything learned since the 1960s," Nesbit said. "It shows the public how physics can be involved in everything" in the golf game, added Raymond Penner, professor of physics at Vancouver Island University in British Columbia, Canada, who had no involvement with the book. Dewhurst's own research has focused on several areas. They include the aerodynamics of a golf ball in flight, the fundamentals of striking the ball, the generation of spin, and a formula for sending the ball in intentionally curved paths, such as deliberate hooks and slices. 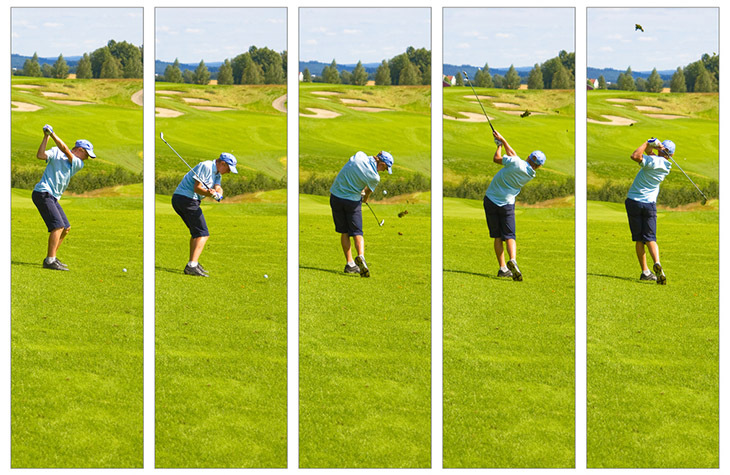 To physicists, the golf stroke represents a means of transferring energy. "The whole swing is about your body creating energy through movement. The ability to transfer that energy to the club is the most important factor in how fast you swing the club," Nesbit said. "Everybody creates enough energy to hit the ball far. It's a matter of translating that energy to the club." Stability is critical for an effective transfer. "None of the primates with strength exceeding ours can even throw a ball, as they can't stand stably on two feet," Dewhurst noted. "Stability means smooth movement." The lesson from that observation: "Don't try to hit the ball as far as you can," he said. "Hit within the limits of your personal stability." It's also important for players to remember that the golf ball "is not just a passive object passing through the air," Dewhurst explained. Rather, it exhibits aerodynamic flight caused by backspin imparted by the club. "That changes the perspective from the idea that you knock it further to the idea of good launch conditions you should aim for," he continued. "You need a sufficiently high launch angle, which many amateurs don't achieve." In addition, Dewhurst pointed out, "It's helpful to know that the contact time between club and ball is about one hundredth of an eye blink. So there's no massaging the ball during contact; it's always a weak shot when you try to do that." Another cause of weak shots, according to scientific studies, is failure to maintain the speed of the swing. "The difference between a professional and a duffer is that duffers hit their peak speed well before impact with the ball and then slow down; they swing too hard at the beginning," Penner said. "Professional golfers' maximum speed occurs when the club hits the ball." Dewhurst's studies of the spin on golf balls in flight have revealed the benefits of new urethane-covered balls advertised as "high-spin." During its brief time of contact with the golf club, the ball skids up the clubface while rotating rapidly. Applying a concept known as the spin coefficient of restitution to the process, which describes how much energy is imparted to the spin, Dewhurst found that high-spin balls get their extra spin because they grip the clubface much better than conventional balls. "The ball actually jumps off the clubface in a spin-skid condition, exactly as if a clock spring had been wound up inside it," he said. That gives amateurs the opportunity to stop the ball on the green as effectively as professional players. Other recent advances in equipment show less promise in improving the performance of recreational golfers, according to Dewhurst. "Handicaps have barely shifted over the years," he said. "The big driver head has made a difference to the average player's driving distance, but it doesn't help them stay any straighter. So in terms of driver performance the game's over. Every improvement is maxed out." Dewhurst and other scientists who study the swing emphasize that golfers don't need a detailed scientific understanding to improve their play. "Golf professionals know instinctively what works," Dewhurst explained. But for recreational players, Penner noted, "it's beneficial to know why what's happening in their swing happens, so that they can start to adjust." Golfers frequently rely on teaching professionals to help them make those adjustments. In recent years, a few teachers have incorporated scientific findings into their instruction. "A scientific understanding of the swing is very important," said Mike Jacobs, who heads the Michael Jacobs X Golf School in Manorville, New York. "It's the golf pro's job to translate the science onto the course." Jacobs routinely uses kinetics and kinematics techniques, as well as the results of scientific studies, to improve his students' swings. "The challenge," he said, "is not to throw the golfer into the deep end of a technical discussion." However deep or shallow the understanding, a feel for the science of the swing is just the first step in improving a golfer's score on the course. "Science can make you more efficient," Nesbit said. "But at the end of the day you've got to practice."